Just as the surveillance market made the move to IP-based communications, the access control market is also moving to IP (or some would say, has moved to IP for all new installations). There seems to be considerably less hype around the changes in the access industry as compared to surveillance, but the move is definitely happening, even among vendors that built their brands on proprietary technology. Hi-Tech Security Solutions decided to look at what the benefits and advantages of IP in the access industry are, as well as some potential snags in the move to this modern communications protocol. For input, we approached two experts who are in the midst of the IP access control world: Wouter du Toit from SALTO Systems sub-Saharan Africa, and Dan Drayton, international sales manager at Paxton Access. Hi-Tech Security Solutions: What are the benefits of moving your access control infrastructure to the IP platform? What is driving companies to make this move? Alternatively, why would a company choose not to move to IP-based access? Du Toit: IP-based systems have been used for many years and are widely used in the industry with little doubt in the stability and speed of these solutions. The benefits are that you can easily expand the system and have many more devices connected (from a SALTO perspective), integration between sub-systems and third-party systems is also a lot easier, and with POE systems a single cable can be used as your network and power connection. Therefore, from a hardware perspective there are some cost benefits. This naturally refers to an access control domain where we can leverage on existing IT infrastructure instead of deploying a separate network. IP technology is the future and even though it is still more expensive than conventional systems, it does simplify management issues. I am not sure why companies would not embrace this. I can understand that companies will use a hybrid of IP and 485 devices to reduce the cost, but many companies out there have intelligent ways of dealing with multiple devices from a single IP address. IP systems allow you to interact in a way that all other IP systems can be merged and integrated or interface with each other. Drayton: The inherent benefit of utilising IP technology is that you are using the existing building infrastructure for your security system. Historically, access control has been characterised as a sector dominated by proprietary cabling solutions and complex wiring, making products more difficult to install and maintain. The simplification provided by IP networks is the main driving force behind the mass adoption; very few solutions available in the market today are not IP ready or indeed dependant. Given that very few solutions available today do not require a network backbone in one guise or another, I’m not so sure there is much choice to not use IP where an online access control solution is required. Hi-Tech Security Solutions: Why do we still have companies that are not using their IP networks for access control? Are there hindrances to moving to IP? Du Toit: It may be a slow adoption rate where companies have spent significant amounts of money on their current technology and can’t just go and convert everything to IP, but with new projects this is not the case and the only factor could be cost, but then the advanced functionality should supersede this argument. You are buying a solution to solve your current needs, but also future needs and IP systems have proven their reliability and scalability. Drayton: Standalone access control systems are more cost-effective in terms of the capex required to install a system in a building. Migrating to IP is a process of education, showing installers and end users the benefits of an online solution where events are highlighted and acted upon in real time. I would suggest that some people who are not that literate about IP technology may be risk averse to adopting it, but with solutions like Paxton’s Net2, we are showing the market that the simplicity of IP access control is easily within their grasp. Hi-Tech Security Solutions: In terms of costs and complexity, does IP-based access offer benefits or is it much the same for the technicians in the field and the administrators? Would the users gain any benefit from IP or would they simply see things happening as always? Du Toit: The user or operator should see no ­difference except that the interfaces used should be easier to use and offer better functionality. The technician on the other hand will need to skill-up and understand the IT environment that he is working in. This should not be a challenge, but could be depending on the skill level of the individual. IP-based systems are more complex, but in access control you need to skill-up your staff to deal with this. Many companies offer basic IP courses so that staff can understand the basics and grow from there. Not having the understanding and skills will make it difficult for a technician to fault find when a problem arises, installation of hardware should not be a problem as most hardware is very easy to install. Drayton: There are clear benefits for utilising IP as it makes the installation, support and maintenance of the system a huge amount easier. 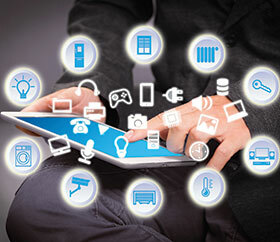 IP technology is being adopted at an expanding rate across the industry, the benefit of having multiple systems utilising the same communication backbone has greatly simplified the ability to integrate access control with other security equipment, such as CCTV, so end-users can match visual recording to real time events. This is an undeniable benefit for the end-user. Companies like Paxton are ­leading the way with making all our integrations available free of charge to help installers and end-users reap the benefits. Hi-Tech Security Solutions: As more ­security (and other) systems are integrated, would IP-based access control not provide for easier integration and more flexibility (if one wants to do video verification, for example)? Du Toit: I think a big driver for IP systems in security is because of integration and bringing multiple systems into a single user interface, where the operator can make informed decisions quicker, without having to understand all the backend systems and how to work in them. Many companies still run multiple systems and manage them in a standalone way, but this is not necessary anymore. There are many systems out there that can tie all your systems together and they are becoming more affordable. Drayton: It most certainly would. Any access control company that has not or is not developing products for use in IP networks is removing itself from the future of our industry. Hi-Tech Security Solutions: When moving to IP, cybersecurity becomes a problem. What steps can one take to ensure your access control infrastructure is secure? Du Toit: Your systems should be secured by encryption so people can’t just tap into your network and hack the security system from outside or inside. The only way you should be able to access the system is from an authorised terminal with secure credentials, but this should not be new to security manufacturers, as they had to protect the security of the hardware in the field before IP systems came along. Systems hosted in the cloud must have multi-factor authentication to ensure a secure system and only relevant data should be stored to protect the individuals’ privacy. Drayton: At Paxton, we take cybersecurity very seriously and rigorously test our products to ensure that Net2 remains a highly robust and secure access control solution. However, it should not be overstated that the first line of defence for any company is their responsibility to take all necessary measures to protect their networks from cyber threats with firewalls, etc. Networks can also be partitioned with VPNs to isolate the security system. Where higher levels of security are required, it is important that end users carefully choose their installer partner so that the right solution is implemented. Hi-Tech Security Solutions: What products do you offer that are IP-based and what are their benefits in the world of access and identity management? Du Toit: All systems offered by SALTO, in one form or another, are IP-based. • SALTOKS is a true cloud-based IP system sitting on your network via Wi-Fi, POE network or 4G. One IP address, handling up to 16 devices and no 485 cabled devices. It is already integrated with third-party IP camera systems to bring forward that single view of events between access control and cameras. • SALTO Space can handle four million users and 64 000 devices with a standard IP interface and hybrid IP solutions. It is designed to talk to third-party systems through IP, HTTP, UDP and SHIP (our integration interface). • Danalock is aimed at the residential market, and can interface with your mobile devices through your home network to give you a truly keyless security solution. All of the above solutions are based on future-proof technology in the IP domain and protected with encryption. Drayton: 95% of Paxton’s global sales are IP-based products. Whether that is our Net2 wired or wireless access control, Net2 Entry video intercoms or our brand new battery powered door handle, PaxLock Pro, the Paxton Net2 range is a complete access control solution from perimeter to the building centre. In providing customers with an IP-based, fully online system with all the benefits of live events and alarms in real time, we pride ourselves on the simplicity of our system, our unique five-year swap warranty and our licence free for life software.